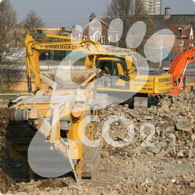 Global Environmental are specialists in the management of carbon in the construction sector. The built environment is a major consumer of natural resources and one of the primary sources of man-made carbon emissions. Environmental Schemes such as BREEAM, CEEQUAL and Code for Sustainable Homes require CO2 targets to be set and require monitoring/reporting on CO2 or energy arising from site activities. We have developed systems to enable clients to monitor and measure their energy consumption during the construction process and calculate the equivalent in carbon emissions. Our carbon specialists are also able to devise and implement methods to reduce your carbon footprint that will enable you to increase the efficiency of your operation while earning the credits required to achieve your sustainability targets.